Same yield, less DNA in the Expi293™ system! FectoPRO® requires equally less DNA and reagent whatever scale used compared to all the other reagents on the market for protein production experiments in HEK-293 (and derivatives) transient expression systems. Therefore FectoPRO® is a cost-effective solution to optimize mammalian bioproduction processes including expression systems relying on high-density cell cultures such as the Expi293™ system (Fig. 1). Fig. 1. FectoPRO® leads to great protein production using less DNA than Expifectamine™ 293. 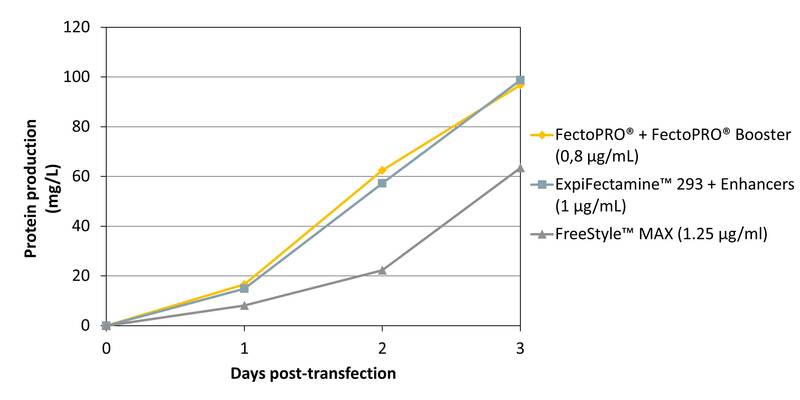 Expi293F™ cells were seeded following the recommended protocol in Expi293™ Expression Medium, and transfected with FectoPRO® + FectoPRO® Booster (0.8 μg DNA/mL), ExpiFectamine™ 293 + Enhancers (1 μg DNA/mL), or FreeStyle™ MAX (1.25 μg/mL) following the standard protocols. The production of antibody fragment (IgG3-Fc) was assayed at different days by protein G affinity quantification (HPLC). Expi293F™ cells are usually transfected at higher density and for transfections with FectoPRO you can either follow our protocol and seed the cells at 1.106 cells/mL one day before transfection or seed the cells as recommended in the Expi293™ protocol. The conditions below have been optimized for the use of FectoPRO® in the Expi293™ system (Table 1). Table 1. Starting conditions for transfection of Expi293F™ cells grown in Expi293™ medium. Conditions given per mL of cell culture. Transient gene expression in Chinese Hamster Ovary cells (CHO) is a technology widely used for rapid generation of recombinant proteins especially in early phases of drug development. CHO cells and their derivatives are also the most commonly used lines for the production of monoclonal antibodies notably due to the requirements for post-translational modifications. In the ExpiCHO™ high-density mammalian transient protein expression system, FectoPRO® allows higher yields to be reached in shorter timeframes. 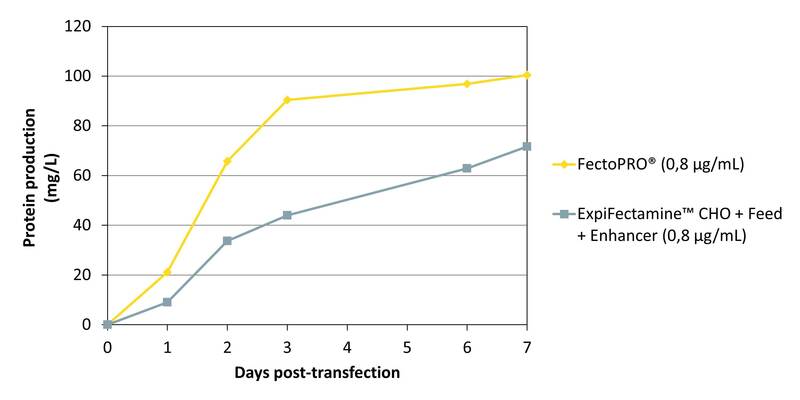 More recombinant protein can be produced in 3 days than in 7 with Expifectamine™ CHO (Fig. 2). Therefore, there is no need to wait for 7, 10 or even 14 days of cell growth using FectoPRO®. Fig. 2. FectoPRO® enables faster protein production in ExpiCHO™ system. ExpiCHO-S™ cells were seeded following the recommended protocol in ExpiCHO™ Expression Medium, and transfected with FectoPRO® (0.8 μg DNA/mL) or ExpiFectamine™ CHO + Feed + Enhancer (0.8 μg DNA/mL) following the standard protocols. The production of antibody fragment (IgG3-Fc) was assayed at different days by protein G affinity quantification (HPLC). The following transfection conditions allow to get the best out of FectoPRO® in the ExpiCHO™ system (Table 2). Table 2. Optimal conditions for transfection of ExpiCHO-S™ cells grown in ExpiCHO™ medium. Conditions given per mL of cell culture. Feel free to contact our Technical Support for more details on conditions to use with FectoPRO in high-density mammalian transient protein expression systems.